A Painting a Day by Joy Argento: NEW DVD!!!! I am happy to let you know that I have another instructional DVD that will be released in two weeks. But you can order it now at the special price of $19.95 with FREE SHIPPING. Click here to go to STEP BY STEP DVDS to order. The shipping date will be September 22nd. 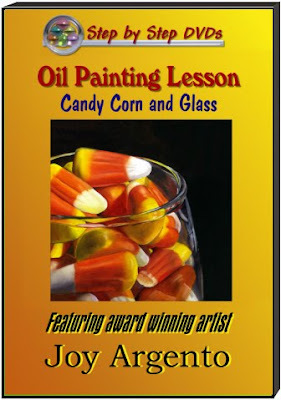 This dvd shows you how to paint glass in oil paint. I also show how I did the background and candy corn, incorporating the same colors throughout the painting for realistic and unifying results. Order now for the special price and free shipping.